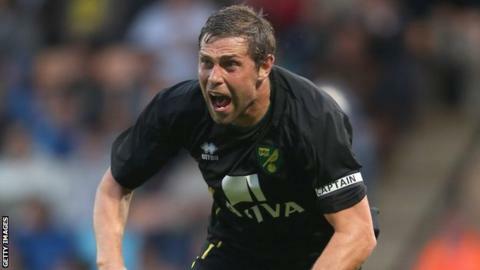 Norwich City striker Grant Holt says he has given up on being picked for England and believes other players have been denied chances by Roy Hodgson. Holt, 31, was the Premier League's second-highest English scorer last season, but was not included in the national squad for Euro 2012. He said his omission was "ridiculous" and does not expect a future call-up. "I gave up on that," he told BBC Radio Norfolk. "I think I'll never be in it. Roy's come in and picking his players." Holt added: "When two friendlies came up [against Norway and Belgium] and I wasn't included it was ridiculous to be honest. "He hasn't given anyone opportunities - people like Nathan Dyer and Danny Graham from Swansea didn't even get a look in, but that's life." contains two uncapped players - Celtic goalkeeper Fraser Forster and Stoke defender Ryan Shawcross - and Holt believes his former Rochdale team-mate Rickie Lambert, who has scored four Premier League goals for Southampton this season, should have been considered. "He's scoring the goals. He's done well. But I think any neutral looking at that list could have written it down beforehand and not been far off," said Holt. "Unless Rickie Lambert scores 25 goals or bags 10 in the next two months I don't think he'll get close." Holt has been in and out of the Canaries line-up this season, scoring just the one goal - the same number he had at this time in 2011-12. And, after a summer of speculation over his future, the forward reacted sarcastically to questions about his commitment to the club. "I've given up this year. I've decided to bin it off," he said. "I've signed my three-year deal and I thought I'd leave it this year, sit back, have a few cans and a few cigarettes and chill with the kids. "It's a ridiculous question. No I haven't [lost my hunger]."